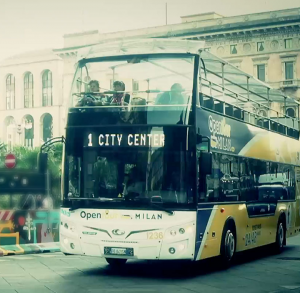 Thanks to the HopOn – HopOff tourist double-deck buses you can easily and comfortably get into the pulsating heart of the cosmopolitan city of Milan, passing by the iconic and fascinating places of the city, such as the Sforza Castle, Brera, the Last Supper, Science and Technology Museum, San Babila, Duomo, Scala Theatre and the modern Gae Aulenti Square. 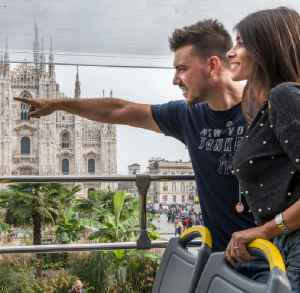 You can discover the ancient and contemporary history of the cosmopolitan city of Milan, passing by the iconic and fascinating places of the city, such as the Last Supper, Basilica di Sant’Ambrogio, San Babila, Duomo, the Scala Theatre and the modern Gae Aulenti Square. Click here to discover all the stops of the City Center line. 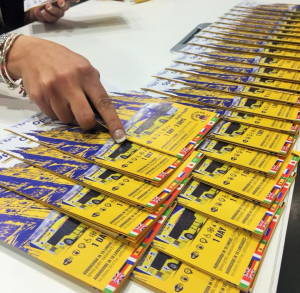 You can learn more about the Milan’s sporting heritage, passing by iconic places such as the San Siro football stadium, the Hippodrome and Casa Milan. Click here to discover all the stops of the Sporting line.